President of Turkey Recep Tayyip Erdogan addresses nation during campaign rally for local elections. Turkish President Recep Tayyip Erdogan on Saturday suggested the mosque in Athens should open with minarets if the Greek premier wants to reopen a seminary in Istanbul. Greek Prime Minister Alexis Tsipras was in Turkey this month and visited the disputed landmarks of Hagia Sophia and the now-closed Greek Orthodox Halki seminary. Tsipras said during the visit to the seminary located on Heybeli island off Istanbul on February 6 he hoped to reopen the school next time with Erdogan. Future priests of the Constantinople diocese had been trained at the seminary, which was closed in 1971 after tensions between Ankara and Athens over Cyprus. Erdogan on Saturday complained that the Fethiye Mosque in Athens had no minarets despite Greek insistence that it would open. The mosque was built in 1458 during the Ottoman occupation of Greece but has not been used as a mosque since 1821. "Look you want something from us, you want the Halki seminary. 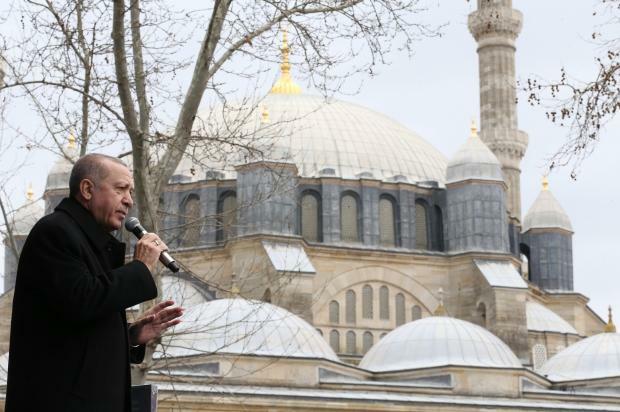 And I tell you (Greece), come, let's open the Fethiye Mosque," Erdogan said during a rally in the northwestern province of Edirne ahead of local elections on March 31. "They said, 'we are opening the mosque' but I said, why isn't there a minaret? Can a church be a church without a bell tower?" he said, describing his talks with Tsipras. "We say, you want to build a bell tower? Come and do it... But what is an essential part of our mosques? The minarets," the Turkish president added. Erdogan said Tsipras told him he was wary of criticism from the Greek opposition. After the independence war against Ottomans began in 1821, the minaret is believed by some to have been destroyed because it was a symbol of the Ottoman occupation. Ankara had returned land taken from the seminary in 1943 but there is still international pressure on Turkey to reopen it. Erdogan has previously said that its reopening is dependent on reciprocal steps from Greece to enhance the rights of the Turkish minority.